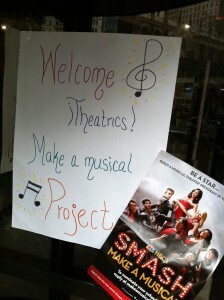 We launched our first NBC’s ‘SMASH’ MAKE A MUSICAL program in our hometown, New York City. This initiative creates sustainable musical theater programs in underserved schools nationwide. We are starting with twenty schools in twenty cities, with the goal of adding an additional two hundred schools in the fall of 2012. As part of our vetting process we don’t pay particular attention to the location of the school. It’s more important that the school demonstrates need and the ability to sustain the program once instilled. 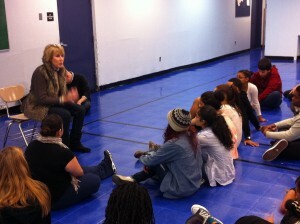 However, when I arrived at the Leadership and Public Service High School in lower Manhattan, I was taken aback. 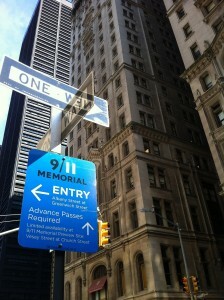 The school is located across the street from what would have been the South Tower of the World Trade Center. The location took my breath away. Here I am, on the first day of the program, at the very first site for NBC’s ‘SMASH’ MAKE A MUSICAL program, and our first school stands in the shadows of one of the most tragic events our nation has faced. At the entrance of the school I was greeted by several hand-drawn posters welcoming iTheatrics—always a good signal of a great school. Our iTheatrics master teachers started the day by working with the three teachers who will present the musical with their students. The teachers explored everything from budgets to schedules, to choosing their musical, casting their show and even rehearsal strategies. After working with the teachers, we worked with the students who will be performing the musical. These kids were well-behaved, charming and they eagerly engaged in our singing, acting and dancing workshops. It was clear these kids were hungry to explore the arts and not afraid to voice their enthusiasm. We concluded the day by conducting a final reflection with the teachers. This is when we learned about the role the school played during the attacks on the World Trade Center. We were taken to the 14th floor where the cafeteria is located. The windows in the cafeteria look directly over the World Trade Center Memorial. On September 11, 2001 they looked directly at the South Tower. Notable in Leadership's history is the effect of 9/11. Leadership, a block south of the South Tower along with its neighbor school found it necessary to evacuate after the second plane hit. The engine of the second plane landed on Leadership's roof, and the school building itself was used as one of the morgue sites in the aftermath. The day of the attack, however, Principal Dolch was on the street welcoming voters to the school's polling booths and thus was on the street when the first plane hit. She suspected immediately that her sister, a Cantor Fitzgerald employee, very likely hadn't survived the first attack and focused on evacuating students and teachers safely. Dolch, school secretary Lisa Quigley, AP Ted Bronsnick, and Dean of Students Neil Marks, smoothly and without external guidance, evacuated the 14-story building from the top down in minutes, out the south-east entrance and down to Battery Park. Julia Martinez and Margaret Espinosa, who worked as special ed, one-on-one paras at the High School for Leadership and Public Service on Trinity Place, risked their lives by carrying two teen-age students to safety after the chairs broke down from being pushed through the rubble. Under the leadership of its current principal, Phillip Santos, the school has made great strides in the decade since the attacks. In fact, the school was recently upgraded to a “B” rating. Principal Santos, we thank you. For your dedication to your school, for your vision, for your dogged determination to rebuild a school marred by tragedy. NBC’s ‘SMASH’ MAKE A MUSICAL program is administered by iTheatrics under the supervision of Timothy Allen McDonald. 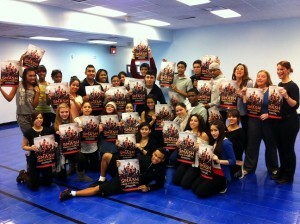 For more information, or to apply to become a part of the program, logon to www.MAKEAMUSICAL.ORG.